A Barley Beach footpath for Woodlands – a brand new development of two bedroom apartments in Canford Cliffs, Dorset and access roads, driveways and pathways for Deer Street Homes in Durham. On the site of the former Lobster Pot pub in Farnham we laid a Barley Beach pedestrian pathway with vehicular access for a development of four, luxurious four bedroom homes. For the hard-landscaping aspect of the Nine Elms Point residential development in London we laid 166m² of SureSet resin bound paving. 370m² of resin bound footpaths and tree pits for Temple Quay – a premier office quarter in Bristol. A 745m² Barley Beach footpath and cycle shelter for the Materials Innovation Factory at Liverpool University, whose aim is to be the world leader in Computer Aided Material Science by 2020. As part of a refurbishment project at the Memorial Gardens in Kent we laid a resin bound pathway alongside a curved memorial wall and disabled parking bays. We installed a 135m² resin bound pathway around the new sports pavilion at Croydon High School for Girls. 255m² of Norwegian Pearl resin bound pathways through beautifully landscaped gardens for Ferndown Manor care home in Bournemouth. Designed with comfort in mind, Ferndown Manor is due to open early this year and has been designed to maximise natural light, with large windows and to be dementia-friendly; from the lighting and colour schemes to signage and layout. We installed a 143m² pathway for Jaguar Land Rover, Milton Keynes and a 268m² for Aston Martin in Wilmslow. Located in the heart of the Science Vale UK Enterprise Zone, Milton Park in Abingdon is home to over 9,000 people and 250 organisations. As part of an office and laboratory development, we installed 274m² of Barley Beach footpaths to a new car park. Kelling Hospital is close to the north Norfolk coast and offers patients rehabilitation in a welcoming, relaxed environment. We laid a 132m² Norwegian Bronze pathway in the newly landscaped garden. We completed phase two of a footpath installation for St Ives Care Village in Ringwood. The newly-built, 60-bedroom care home provides a warm and caring environment for people with nursing, residential and dementia care needs. Founded in 1760 Helston Bowling Club in Cornwall is one of the oldest clubs in the country. As part of a refurbishment project we installed a 913m² accessible pathway in Barley Beach, Sterling Midnight and Sterling. In Salcombe, we laid the first of two driveways for a two-home development, an impressive turning driveway for a home undergoing extensive redevelopment in Wootton Under Edge and a Norwegian Bronze driveway in Wimborne, Dorset. In November, we laid two pool surrounds – one for an indoor pool in Eastleigh and another for an outdoor pool in Otterbourne. Due to open by the end of this year, Oxford BDI is a state-of-the-art building at Oxford University’s Old Road Campus; a research centre focusing on the causes and consequences, prevention and treatment of disease. We installed a 207m² accessible pedestrian area in Sterling Natural Aggregate. Work on Esplanade Green in Newquay, linking Fistral and Crantock beaches is nearing completion. With spectacular coastal views, the new SureSet resin bound footpath is safer, less muddy and offers greater accessibility for wheelchair users and people with reduced mobility. A highlight for October was holding our first Elite Approved Installer Award ceremony at the National Self Build and Renovating Centre in Swindon. Attended by many of our Elite Approved Installers, the event was kindly sponsored by Dural and Long Rake Spar. The winners were GLW Landscapes Ltd, Botanica Resin Bound Driveways and NW Paving and Landscaping Ltd. You can read more about the event here. At the Cowcaddens underpass in Glasgow the Garscube Link was completed in 2010. Part of the original project included the installation of a red resin bound surface, laid by a competitor. We were contracted to replace this resin bound surface with 855m² of our bespoke blend of Red Oxide recycled glass. As part of an expansion project at Nyetimber, a vineyard in West Sussex, we laid 2,773m² of Chestnut and 23m² of Barley Beach to a courtyard, access road and pedestrian area. We installed 290m² of Norwegian Pearl footpaths throughout the car park at the new Fosse Shopping Park in Leicester. For St Thomas with St Stephen Church in Balham we laid an access road and pathways in Tuscan Barley Beach creating a fully accessible entrance. We laid a 43m² footpath at Rowans Hospice in Purbrook and 974m² to pathways, the car park and parking bays at the Highland Hospice, Inverness. We also took a visit to the home of the world’s largest furniture retailer to lay footpaths for Jaguar Land Rover, Danderyd, Stockholm, Sweden. A Sterling driveway for a modern ‘new build’ in Downley, Bucks, a Chocolate turning driveway in Blackheath and an impressive 128m² Barley Beach driveway in Lapworth, Solihull. While in Winchester we completed a project for an exclusive Millgate development consisting of an access road and two driveways. For the new Park Rise development of stylish one and two bedroom apartments in High Wycombe we laid 285m² to steps, tree pit, parking bay and ramped pathway. “One of the best companies I’ve used for work at my home! A friend had used the same installer and was very happy with what they had done. Nick was very informative and helpful. Comments from a residential customer in North Wales who had a driveway installed by our Award winning Approved Installer, Botanica Resin Bound Driveways. We laid numerous driveways, including 135m² in Marlborough, a 409m² turning driveway in High Wycombe and in Chertseywe installed 58m² of SureSet to a ramp and steps, laid on a concrete base with heating mat. 152m² of Sterling Silver footpaths for the new home of the Met Office and their ‘supercomputer’ at Exeter Science Park. At the Grade II* listed St Cross Building at Oxford University we installed 43m² Barley Beach and SureCell, creating a DDA compliant graded pathway to form an accessible entrance. For a new single-storey double height Parish Hall at Redland Parish Church in Bristol we laid a 121m² Norwegian Pearl accessible footpath and ramp. The refurbishment of Garden Halls by the University of London included Cartwright Gardens where we laid a 1293m² Chestnut footpath. Previously a private park that was only open to key-holders, the redeveloped Cartwright Gardens will be open to the public. August was a really busy month for school paving projects because the long summer holiday is the ideal time for refurbishment projects. You can read about some of the work we carried out for schools here. For a development of flats at Tarquin Close in Coventry we completed a 140m² internal installation to a communal area in Bronze. Driveway projects included 381m² Barley Beach in Taunton, 123m² Sterling Midnight in Chard, 116m² Norwegian Pearl driveway, laid up against granite setts and Aco channel drain in Winchester and a 64m² Apollo driveway in Leeds. Number nine Arkwright Road in London is nearing the end of a project converting offices back to residential use – nearly 100 years since the original large detached villa was converted into offices. One of the finishing touches is a 326m² Bronze parking area. Windmill Farm in Upper Langdon is a brick tower mill built in 1810 and converted into a house around 1900. The current owners are restoring the windmill including new sails to generate their own electricity. As part of the restoration project we laid 500m² of Sterling Silver, Sterling Forest Green and Chestnut to pathways, terraces and balconies. Lyde Green is a housing development in Emersons Green, Bristol, designed to appeal to families, first-time buyers, investors and professionals. As the development is nearing completion we were on site installing 421m² of tree pits in Norwegian Pearl. Our Chocolate Natural Aggregate was the perfect match for the parking area and pathway for the stone built Old Rectory in Marlborough – a Grade II listed four bedroomed property. Read about our indoor swimming pool installation in Rutland. Following the demolition of Studios and Stages at Television Centre, in November 2015, the construction of 950 homes, offices, new Soho House and a range of leisure facilities is nearing completion. As part of the finishing touches to the external features of this development in White City we laid 354m² of Smokey Rose – the colour was decided upon following a request for a “pink/light grey colour to complement adjacent paving”. In Abergavenny we laid pathways and tree pits in Norwegian Bronze and Astro Peake to Castle Street Car Park. What better pathway surfacing for The Living Rainforest than SureSet Permeable Paving! The Newbury based charity immerses visitors in real rainforest experiences. For Grangewood Farm Livery in Swadlincote we installed 478m² of bespoke Harvest Ivory to the entrance of the private stables. Newly opened Savernake View in Marlborough, Wiltshire is a 24 hour residential, nursing, dementia and respite care for the elderly. We were onsite to lay a 250m² footpath in our natural looking Barley Beach. In Cambridge we installed a 44m² Chestnut footpath in the car park of the Fitzwilliam Museum and a 408m² car park in Barley Beach for the new Nuffield Hospital. We had triple celebrations in July – our website was one year old, we launched a mobile app: Permeable Paving by SureSet and introduced our Tree Pit TradePack, providing sufficient aggregate and resin to install a 10m² area at a depth of 40mm. Our app is available for free download in Google Play and itunes – offering you the opportunity to shop, chat or download – anywhere, anytime. Four driveways in Swansea, Sandwich Bay, Oxshott, Surrey and Orme Square, London. In Richmond upon Thames, Twickenham, we laid 346m² of Barley Beach to the driveway and pathway leading to the front and around to the side of the house. This time of year is popular for swimming pool projects and during July we installed two swimming pool surrounds – one indoor and one outdoor. The indoor pool surround was in Rutland in a bespoke blend of Danish Blue, while the outdoor pool surround in Southampton was in Barley Beach Natural Aggregate. For Jaguar Land Rover in Acton we installed a pathway around the showroom and in Aberdeen we laid SureSet to the pedestrian area and handover bays. Aston Martin, Chichester had a 164m² Barley Beach forecourt laid. While the installation at Mercedes Benz in Milton Keynes consisted of 109m² pedestrian walkways in and around car parking area. This new garden at the Sandgate end of Lower Leas Coastal Park in Folkestone was created on a barren piece of land to remember people who “die before their time”. We installed a 127m² Traffic Black and Aqua pathway – the design symbolising the journey of life and dealing with death. One highlight for us was being shortlisted for the South Wiltshire Business of the Year Digital Marketing award. Another was launching another brand new SureSet ‘Supply Only’ product – Tree Pit Trade Packs. In Abergavenny, as part of a £1m project to improve the High Street, Nevill Street and St John’s Square, we laid a 224m² Norwegian Bronze access road at Castle Street Car Park. Improvements will be completed in time for Eisteddfod – a celebration of ‘Welshness’ in August. Interesting fact: every year 330,000 gallons of water and five miles of toilet paper are used at the Eisteddfod Festival. We visited the seaside to lay 181m² of SureSet in Midnight around stone setts that form the words of the first verse of ‘If’ by Rudyard Kipling. This famous poem can be found on the promenade at Westward Ho!, North Devon. Interesting fact: Westward Ho! is the only town in Britain to have an exclamation mark in its name. At Grange Farm Centre in Chigwell, we lifted and replaced 291m² of failed resin bound paving (installed by another company). Read the full case study. Set in more than 900 acres, St George’s Hill in Weybridge is one of the most sought-after private estates in England. Access onto the gated estate is controlled by security personnel and restricted at all times. We installed another driveway on this prestigious estate – a 289m² Bronze driveway. We also installed driveways in Norwegian Pearl, Sterling and Barley Beach were installed in Croydon, Wickham Bishops and Hemingford Abbots. Interesting fact: in St George’s Hill, each house is required by local laws to have at least one acre of land. Nine Elms Point is an ongoing development of 645 studios, apartments and penthouses. We laid 650m² of Barley Beach and 650m² Sterling to pathways on the ground floor and raised walkway. Interesting fact: around 35,000 people are expected to move into all the new homes that are being built in the development of Nine Elms. Getting information or being able to buy a product immediately is something we have grown very accustomed to – and apps play a key role in making this possible. We have just launched our own mobile app, Permeable Paving by SureSet, which is available for free download in Google Play and itunes. Interesting fact: 63% of UK millennials prefer making purchases using a mobile app compared to any other platform. We were delighted to be shortlisted for a Digital Marketing Award. Discover SureCell®, our easy sub-base option. Find out what Dan’s been doing. Four easy ways to spruce up your garden. Have you heard about our bespoke EURO 2016 samples? Interesting fact: In 1999, there were just 23 Blogs. Today, there are over 1.5 billion Blogs on the internet. Reproducing the poem “If” by Rudyard Kipling at Westward Ho!. A substantial pool surround for the recently refurbished Jubliee Pool in Penzance. Our public realm installation at the Oval Triangle. In Cheltenham we installed a 65m² beach theme for a customer who had seen a similar installation on our website. This was created using Almond for the beach and 13 different blends of blue for the sea. As a £7.5m project nears completion we were on site to lay our Natural Aggregate in Sterling to footpaths in the car park for Tewkesbury Leisure Centre. We exhibited at the Homebuilding & Renovating Show with our Approved Installer Botanica who received a Marshall’s award from Kevin Keegan. Read our Blog. We were delighted to be working with the designer of the official RHS Chelsea Flower Show Garden: Greening Grey Britain. Ann-Marie Powell selected SureSet resin bound paving for her design because of its permeability and contemporary look. Read our Blog. Closed for repairs following storm damage, the Jubilee Pool in Penzance reopened on May 28. We laid a 1363m² bespoke Pool Green pool surround based on local ‘Greestone’. Read our case study. Set in the idyllic grounds of Hinxton Hall, Cambridge Genome Campus hosts scientific research, courses, conferences and a nature reserve. Sponsored by Wellcome, the Campus is undergoing an expansion to create an international centre for scientific, business, cultural and educational activities. SureSet was specified for a series of pedestrian pathways within the Campus. We carried out a number of ‘no dig’ installations that included a pathway for registered charity, Garden Organic in Coventry for their new Paradise Garden, created as a tribute to the late Geoff Hamilton of Gardeners World. Another was a roof deck in Wimbledon Park Road. At the Walkergate Park Centre for Neurorehabilitation and Neuropsychiatry in Tyne and Wear we installed a 547m² Barley Beach footpath. We laid a pathway for Corpus Christie College, Oxford and a kidney shaped tree ‘trench’ and tree pits in Smethwick town centre. Our second resin bound installation for Care South Home this year, we laid a 92m² footpath for St Ives House in Ringwood. Read about our installation at Wickmead Care Home. Ensuring accessibility, a resin bound courtyard and ramp was installed at Kennet Island, Reading. Located close to the town centre Kennet Island is a development of newly built, contemporary designed apartments and houses. For a mixed use development site adjacent to Queens Park Station in South Kilburn, we installed 376m² to tree pits and cycle shelters in Barley Beach and Norwegian Pearl. Replacing the original 1960’s building, a new £8.8m bus station opened in Allhallows, Bedfordshire in 2015. As part of some ‘finishing touches’ to the project, we laid 30m² of resin bound paving in Bronze to the bin store.We installed a school logo for Eden Boys’ School, Birmingham in bespoke Boysenberry and Elephant Grey from our Spectrum® range of recycled glass. This is our second project for the Tauheedul Trust having previously installed a logo for Eden Girls’ School, Coventry in November 2015.The Mayor’s London’s Great Outdoors programme, to improve public spaces across London, provided an opportunity for funding via the Pocket Park scheme. After realising how much maintenance is involved with loose gravel, SureSet was specified to replace it and we laid 275m² of Barley Beach resin bound paving in Haringey’s new Pocket Park. Read the full case study.In Farnborough, we installed 215m² of Norwegian Pearl pathways and cycle racks for the newly built office development at Brennan House. At Hopscotch Pre-School in Ferndown, Dorset we laid a 52m² pathway in Barley Beach. The neutral buff colour was chosen for the footpath leading from both classrooms – the Rainbow Room and the Sunshine Room – to the play area on their own little nature reserve. Residential installations included driveways in Kent, Shenley, Salisbury and Southampton and the final phase of the driveway and car lift installation at Gerrards Cross. Our Installation Team headed to France in April to lay 407m² of SureSet in Norwegian Pearl for a new Jaguar Land Rover showroom in Lyon. Being delivered by Bouygues Development and Londonewcastle the Queen’s Park Place, South Kilburn is a development of 144 apartments and ground floor retail unit. We installed 200m² of permeable resin bound paving in Sterling, Barley Beach and Norwegian Pearl outside the retail space into which Marks & Spencer are moving into in November. Contracted by CVU SureSet was specified for 1407m² for the public realm area at the Oval Triangle in Norwegian Pearl. Perfect pocket park paving for Haringey Council. Permeable pedestrian paving for Oakwood House. SureSet solution for Seabrooke Rise. Celebrating Tim Peake with 12 SureSet space snippets. The gentle tease of nicer weather has prompted people to contact us about cleaning their SureSet surface. This Blog has a really useful section on routine maintenance. For residential customers, our Installers have been busy laying three resin bound driveways totalling 333m² in Nottingham, Leeds and Shenley using our Natural Aggregate in Mochachino, Bronze and Chocolate. Whilst in Fulham, we installed a 16m² Chocolate pathway. Owned by First Wessex, Oakwood House in Farnborough is a block of residential flats. Grass in the communal rear garden was unable to grow due to trees blocking sunlight – making the ground either too dry or too wet. SureSet in Barley Beach was specified to replace a 95m² grassed area because it “created a dry and safe place enabling the residents and the children to use the area all year round”. Read the full Design and Access Statement. In Newbury we laid 12m² of our sub-base SureCell® and and 6mm Norwegian Bronze to create wheelchair access outside bi-folding doors. We laid a 405m² Barley Beach pedestrian area to apartments on Bramley Road, London and in Smethwick, we laid 405m² of resin bound paving in Autumn Tan for a new Barrett Homes development of 200 homes in Birmingham. Completing an ongoing installation at Seabrooke Rise, Thurrock we laid a 15m² tree pit complete with SureCell® in Almond. As work is nearing completion at Cheshire Business Park in Lostock Gralam we laid a total area of 81m² of SureSet to a bin store and cycle shelter for three new units. Read the full case study about our installation at St John’s Hall in Penzance. In time for the Cheltenham Festival, we laid an additional 10m² to new columns in Sterling and Barley Beach. As part of a £150 million extension at Fosse Shopping Park in Leicester we laid a 183m² pedestrian area outside the new Primark store. Ever wondered what a SureSet driveway looks like after 18 years? If you are going to the National Homebuilding & Renovating Show, April 14 – 17, NEC Birmingham don’t forget to come and say hello. We’re on Stand F109. Residential installations in February included driveways in Ravenshead, Nottingham and Guildford and a 98m² Sterling patio in Romford. While for Scholar’s Place in Gerrards Cross we laid 190m² of Norwegian Bronze to two of a four driveway project, complete with three car lifts for underground parking. The other two driveways will be installed in March. Seabrook Rise is a council housing development of 53 new homes in Grays, Essex. We laid resin bound in the complementary colours of Almond and Golden Pearl to pedestrian areas within the development. As part of the £100m-plus redevelopment of Morriston Hospital in Swansea we installed 147m² of resin bound pathways in Barley Beach. Additional work at Haberdashers Girls School, Elstree consisted of a 460m² access road and courtyard in beautiful natural colours of Golden Pearl and Bronze. For Birmingham University, the first in England to accept students from all religions and backgrounds, we completed a 527m² installation of resin bound pathways and access roads. Across the road from our creative paving installation for Butlin’s in Minehead completed last year, we returned to create an additional 262m² beach theme outside the American Diner. Following the installation of an exercise and training area last month, we returned to lay surfacing for a 125m² rehabilitation area in Norwegian Bronze at Battersea Dogs & Cats Home in Windsor. We installed 380m² of Barley Beach permeable pathways for Wickmead Care Home in Bournemouth which offers elderly, specialist dementia and nursing care to 50 residents. With weather being so mild, January was an unusually busy month for us and we hosted our first exhibition of 2016; the National Self Build and Renovating Show at the NSBRC in Swindon was really well attended and we’re in the process of sending out requests for brochures and samples. We are now looking forward to Ecobuild – our next exhibition in March. For Keech Hospice, based in Luton, providing care for adults and children with life-limiting and terminal illnesses in Milton Keynes, Bedfordshire and Hertfordshire, we laid surfacing for a new sensory garden. SureSet was specified for a private permeable parking area for Goldney Road Villas, a development of eight houses, built on brownfield in Maida Vale. Downing College was founded in 1800 and is a constituent college of the University of Cambridge. Currently undergoing refurbishment, we laid a new 170m² surface to the service yard. Radcliffe Observatory Quarter is “one of the most significant development projects the University of Oxford has undertaken for more than a century”. We were there installing surfacing for a cycle park. Built by the Wedgewood family in 1751, we worked with ACO on bespoke drains for the Big House in Burslem, Stoke on Trent. Read our case study about a previous joint project Collaborating and Creating Customised Drainage Channels. We installed 50 tree pits at Cardiff Gate Retail Park. A purrrfectly permeable new exercise area and playground for canine guests at Battersea Dogs & Cats Home in Windsor. SureSet ‘wadi’ for children’s water feature at the recently redeveloped Mushrif Park in Abu Dhabi. A Grand Installation by SureSet Approved Installer Gibson Gardens. 10 reasons to treat your tree to a resin bound Tree Pit. We were delighted to start our New Year as winners of Butlin’s Christmas jumper competition! Butlin’s conference and events team invited companies to tweet their Christmas Jumper Selfies using #MyChristmasTeam. We installed a combination of turning and straight resin bound driveways in Cheltenham, Harpenden and Somerset. While our nationwide network of Approved Installers completed 15 installations ranging from residential driveways to Leopardstown Racecourse. For the Lakewoods development in Tunbridge Wells, Kent we installed 339m² of resin bound pedestrian and vehicular access in Barley Beach for new shared ownership apartments. We installed 1287m² of resin bound footpaths in Almond and Golden Pearl throughout Seabrooke Rise in Thurrock, Essex. The development is part of Council plans to increase the number of affordable new homes in the area. In Greenwich, just a stone’s throw from the O2 is the Peninsula Riverside Development. We installed 380m² of permeable resin bound pathways for plots M0114 & M0115 in the Southern Quarter. Designed in Georgian style, to complement the surrounding area, Gleneagle Manor in Harpenden, Hertfordshire consists of 26 new luxury apartments built on the site of a former hotel. 383m² of permeable pathway now runs around and through the apartment blocks. We installed a Norwegian Pearl permeable pathway for the new Listers Land Rover dealership in Hereford. Following our extensive installation at Cheltenham Racecourse we returned to install four column bases in Sterling Natural Aggregate. You can read the full case study here. In 2016 the National Horseracing Museum in Newmarket is moving from its existing location to the new National Heritage Centre for Horseracing and Sporting Art. We installed a resin bound internal courtyard in Chocolate. Built in 1828, and currently undergoing restoration we laid an accessible ramped pathway in Barley Beach at the entrance to St John on Bethnal Green Church. Branding for the new Crescent development in Hinckley, Leicestershire is a brightly coloured stripe. This was recreated in a permeable feature pathway using Lemon Yellow, Bright Orange and Traffic Red from our Spectrum® range of recycled glass. You can read the full case study here. In the beautiful Georgian city of nearby Bath we replaced a further three resin bound tree pits (originally installed by another company) in Brunel Square. We installed a Winter Frost ramp and landing to the main entrance area of HMS Calliope in Tyneside; part of a £2.9m extension and refurbishment project. At the new Live Works quayside scheme in Newcastle we laid a permeable access road in Norwegian Pearl for the Live Theatre. The design included 100mm and 200mm wide curved bands in Sterling and Golden Pearl. Following a meeting at FutureScape in 2015, we laid a 53m² Norwegian Pearl paddock area for dogs living at Battersea Dog and Cats Home. Phase 3 completed our extensive resin bound pathway installation at St Ilan’s Comprehensive School in Caerphilly, while in Newham, East London we installed a permeable tree pit for Maryland Primary School and Children’s Centre. We have been working with Walter Jack Studios on an art project at a Taylor Wimpey Development in Wandsworth. The design includes eight (full and half) 1.5m ‘columns’ and four 1.8×3.6m ‘carpets’ using colours from our Spectrum® range of recycled glass. “We approached SureSet to use their material in ways it hadn’t been used before. Firstly working with them on prototypes and samples to achieve our aim. They have been, at all times, professional, intelligent, enthusiastic, generous and patient – and very persistent. Ever wondered what a SureSet installation looks like? Have a look at our time lapse video of a fully SuDS compliant driveway. The installation consisted of 45m² of our sub-base SureCell® topped with 6mm Natural Aggregate in Norwegian Bronze. The driveway was finished off with a feature poppy made from our Spectrum® range of recycled glass in Traffic Red and Traffic Black. We were back in Allington, Wiltshire to complete an extension to the Barley Beach resin bound driveway we installed in 2014. The homeowner likes the fact that after powerwashing the drive there are no puddles, and their cat enjoys the warmth of the sun retained in the SureSet! In Thurrock, the new Derry Avenue Development – 25 apartments for over 55’s – is now surrounded by 205m² of stunning accessible SureSet resin bound footpaths in Almond. While our Approved Installers carried out most of our Residential installations during November, we completed Phase 2 of a project for Chelsea Manor Court in London and installed a patio for Callaways Farm in Wellington, Somerset. It was our third project for Kensington Prep School in London where we installed additional decorative resin bound paving in Sterling and Primrose. With a bespoke blend to match the school colours we recreated the logo for Eden Girls’ School, Coventry at the entrance to their new school. Construction began in January on the all-girl Muslim free school in Foleshill which is run by the Tauheedul Free School Trust. Hotham Primary School in Putney is nearing the end of a refurbishment and extension project to accommodate more children. We installed permeable resin bound paving to a pedestrian area around established trees in Barley Beach as part of the landscaping scheme. 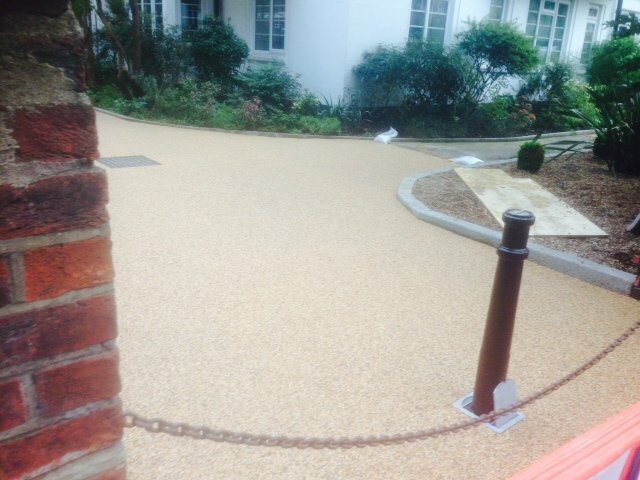 At Woodland Manor Care Home in Chalfont St Peter, Buckinghamshire we installed a Barley Beach resin bound pathway. This brand new 24-hour nursing care home for elderly people and those living with Alzheimer’s and other forms of dementia is due to open in January 2016. As part of the redevelopment of Walnut shopping centre in Orpington, London we installed a double tree pit outside the new Odeon Cinema. For The Methodist Church in Tower Hamlets we installed a fabulous looking ramped pathway in Barley Beach. The installation of a 570m² resin bound pedestrian area contributed to the redevelopment of the old Buckinghamshire County Council offices. As part of a £6m refurbishment project at Tollgate Retail Park in Colchester, we installed 211m² of our grid structure sub-base SureCell® and Tuscan Terracotta creating fully permeable tree pits and pathways in the car park. In Newmarket, a new National Heritage Centre for Horseracing is being built on the site of the Palace House and Stables. We were there installing a 110m² Chocolate internal courtyard. The poppy, a symbol of remembrance which includes a time lapse video featuring the installation of a SuDS compliant driveway. Find out about our SureSet Seasonal Specials on TradePacks and installation. This Christmas we are donating to Alexander’s Appeal. Read about #LittleStar and help raise awareness of atypical teratoid/rhabdoid (ATRT). Paving ideas for Access Roads and Car Parks. …was replicating the famous zebra crossing for Abbey Road Studios. Part of Universal Music’s ongoing expansion plan is a gift shop and we were contracted to lay SureSet on the main ramped entrance to the new shop. Full case study coming to our website soon. 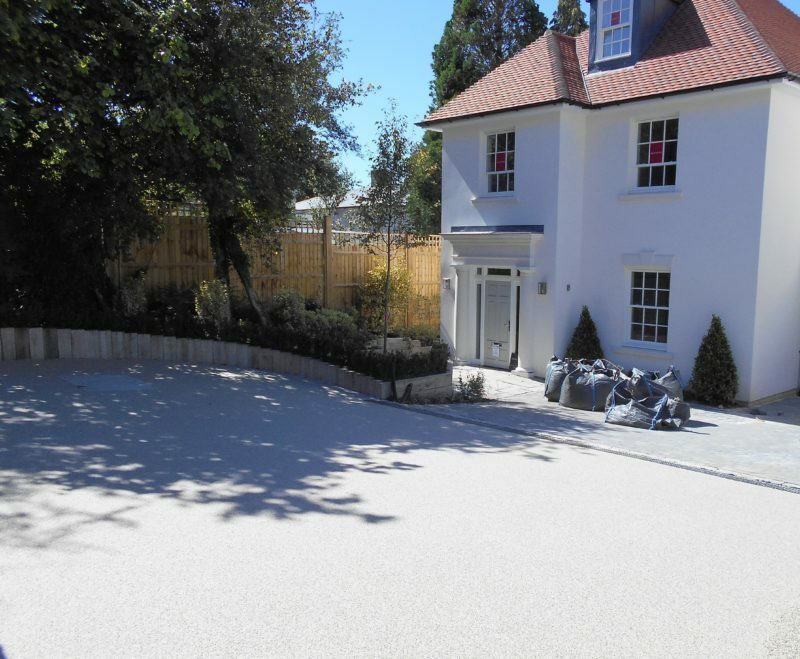 A total of four natural aggregate driveways in London, High Wycombe, Cambridge and Surrey were installed using colours of Norwegian Pearl, Barley Beach and Norwegian Bronze and two pathways in Buckinghamshire and Chiswick. In Tunbridge Wells, we completed footpaths at the Lakewoods Housing Development where our Barley Beach Natural Aggregate sits perfectly with the countryside environment and landscaped streets. Our network of Approved Installers completed 40 projects during October including a replacement 120m² Chestnut driveway for a couple in Poole – you can read the full case study ‘No problem should ever be solved twice’ on our website. We carried out another repair for a property in the Royal Borough of Kensington and Chelsea. A driveway and car lift were installed by another company which began to break up after just four months. Their landscaper, who we regularly work with, suggested replacing it with SureSet. 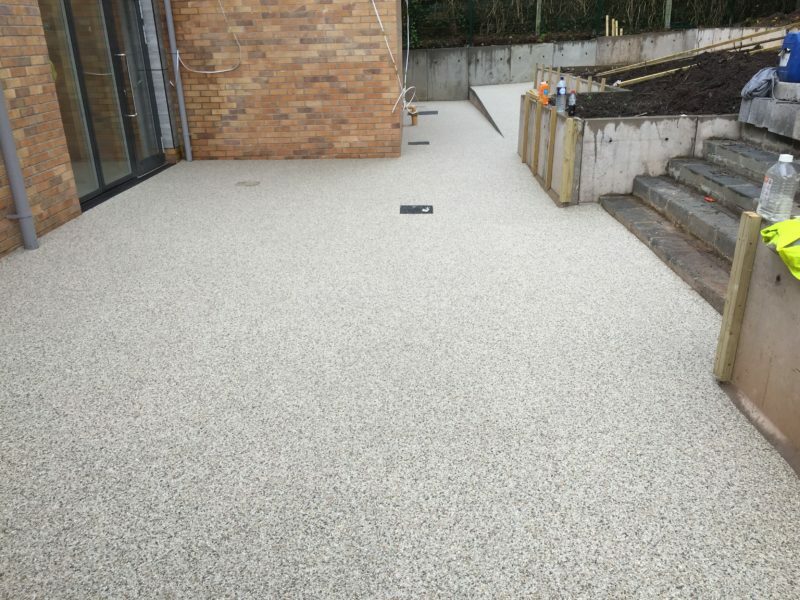 When we removed the existing material to prepare the base to our requirements we found out why it had failed so quickly – the resin bound material had been laid at an 8mm depth. To put that into perspective, we installed the replacement surface at a depth of 22-35mm. Read more tips for choosing a reputable, reliable resin bound company on our Blog ‘Please, please don’t purchase purely on price, purchase on value‘. At Vodafone’s Head Office in Newbury we installed a footway and steps leading from their car park to the office building. With the steps being made out of wooden sleepers and the car park being in a woodland style setting our Natural Aggregate Barley Beach was a perfect match. We completed two courtyards at CUBRIC (Cardiff University’s Brain Research Imaging Centre). The new £44m brain research imaging centre is due to open in spring 2016. At Castle School in Cambridge we installed an additional footpath and completed a 570m² pedestrianised area at Aylesbury Magistrates Court. If you missed our October Blogs why not have a look now? How SureSet can help keep golf courses in a playable condition with How to keep your green green. We’re giving you the ‘green light’ to get creative with our Loose Glass. For residential customers here are some Paving ideas for Gardens and for our commercial customers we have Paving ideas for Housing. The unveiling of the Manchester City Football Club City Circle installation on 24 September. It was a great evening for Man City fans who got to see their discs installed within the City Circle and meet players. Finding out we had won a BALI Affiliate Award – we were so excited when the letter arrived informing us. We are now looking forward the Award celebrations in December. Being accredited the Investors in People Standard was fantastic reassurance that we are working in the right way when it comes to sustainability, supporting staff and maintaining high standards of products and customer service. This month we installed a 130m² turning driveway in Cheddar, a 116m² Barley Beach driveway in Aylesbury, in West Hill, Twickenham a Norwegian Pearl 72m² driveway and in London we laid a 13m² Tuscan Barley Beach footpath. In London we carried out two projects repairing resin bound driveways installations by other companies. Phase II of our project at Cheltenham Racecourse for a 1,200m² pathway began. The case study is on our website. We installed 81m² to tree pits and pedestrian areas at Willesden Green Cultural Centre which was officially opened (following an £11m rebuild) in September when the Rugby World Cup trophy tour stopped in Brent. In High Lane, Stockport lies a Grade II War Memorial, erected in 1920 by parishioners commemorating men had who fought in the Great War (1914-1919). As part of a refurbishment project we installed 121m² permeable resin bound paving. A few miles from the city centre, Cambridge Research Park is a self-contained community. Alongside the Wellcome Trust Sanger Institute a new sequencing hub is nearing completion where we laid 169m² of 6mm Norwegian Pearl to pedestrian footpath/bridge for the new piazza area. Wombwell housing development in Barnsley is being built with funding from the Homes and Communities Agency by local affordable housing developer Lovell for South Yorkshire Housing Association. As part of the landscaping project SureSet permeable paving was specified for 547m² of footpaths. The Taylor Wimpey Radius development in Wandsworth consists of 152 apartments built to level 3 of the Code for Sustainable Homes. Plan Projects, appointed Walter Jack Studio to produce a landscaping design that included a component of public art for which SureSet was specified. Read the full case study. John O’ Gaunt School in Hungerford received funding to invest in its infrastructure and technology in order to compete with larger schools. SureSet resin bound paving was specified for the external landscaping project and we installed a 228m² permeable pathway in Norwegian Bronze and Bronze. The Michael Tippett School in Brixton is currently benefitting from external works and SureSet was specified for a 118m² resin bound footpath running through a playground featuring an outdoor gym and a sensory play area. We installed a 110m² pedestrian area in Barley Beach permeable resin bound paving at Kensington Prep School which complemented adjoining timber and rubber crumb areas. At Hampton School for boys we carried out a 38m² repair to damage that had been caused to a previous installation. At Mid Kent College in Maidstone we installed 180m² of Barley Beach resin bound pathways for this 100 year old educational establishment. Nearing the end of a six year, £3m redevelopment programme at Yarm School in Stockton on Tees SureSet permeable paving was specified for parking bays and pathways. Built in 1901, St Thomas in Balham is a lively Anglican church in southwest London, serving Streatham Hill, Clapham Park and Balham. Phase I of a two phase footway and car park project saw the installation of 174m² of Tuscan Barley Beach resin bound paving. At Haberdashers Girls School in Hertfordshire we installed Phase I; 105m² Bronze and 194m² Golden Pearl to a landscaped courtyard. Phase II will be an area for pedestrian and vehicular access. Birmingham University is currently undergoing extensive refurbishment and modernisation. Due to be completed later this year, we installed Phase I of this project to install 385m² of resin bound pathways. Phase II is an access road. We completed a 296m² Barley Beach permeable footpath for The Chilterns – a soon to be completed development near Aston Clinton, High Wycombe. Our Approved Installers completed 30 resin bound paving installations during the month that included many schools, residential driveways and pathways, a care home, a garden centre, Clarkes Village in Somerset and a monastery. Stoke Lodge Primary School in Patchway has a wonderful new landscaped play area. A 40m² SureSet permeable resin bound footpath in Barley Beach links together four brightly coloured circles, each with 1.5 metre play grade poles. We installed a 130m² resin bound internal courtyard in Barley Beach for Burlish Park Primary School in Stourton on Severn. This brand new £5.5m building includes two sports pitches, a multi-use games area, car park and bicycle store. Yewstock College in Sturminster Newton has a new permeable resin bound 125m² internal courtyard that provides access to the classrooms. As part of a £3m redevelopment programme at Yarm School in Stockton on Tees, we installed SureSet permeable paving to the parking bays. We are always excited to work on artistic projects and were delighted to help West Country artists Scraptors with their Sculpture Trail. ‘We will never forget’ commemorates the centenary of World War One and can be seen at the National Trust Stourhead estate in Wiltshire from September 1. August was also a very popular month for driveway installations, varying in size from 65m² to 595m². Most were installed in traditional colours from our popular Natural Aggregate range, but one customer in Buckinghamshire opted for a Midnight driveway with a contrasting Sterling tree pit – and the result was visually stunning. Another customer in St Albans chose Winter Frost for a 90m² patio and footpath installation which looks amazing! With the majority of August being dedicated to school projects, many of our commercial installations are ongoing and will be completed during September. These include new pathways for the Kilburn Regeneration Project and Cheltenham Racecourse and a colourful external landscaping project in Wandsworth. During August our nationwide network of Approved Installers also completed 22 installations for us. A July highlight for us was completing the Manchester City Football Club ‘City Circle’ installation on the Etihad Stadium side of the SuisseGas bridge. This iconic landmark has the words of Blue Moon, with letters containing fans tribute disks, framing a huge circle, at the centre of which is a magnificent SureSet MCFC Crest. We hope to bring you the images very soon. Another memorable project was working with other BALI members on the Helen Elks-Smith Garden at RHS Tatton Park. The Garden won a gold medal and the People’s Choice award! Read the full story on our Blog. Will Adams roundabout, Medway, Kent – we transformed the Will Adams roundabout, creating a 522m² Japanese garden with Natural Aggregate in the colours of Charcoal, Norwegian Pearl and Meadow Green. Grosvenor Hill Court – we installed a border to an internal courtyard for this building of luxury flats in Mayfair. Wood Green Town Centre – as part of a project to improve public spaces by creating a safer, brighter and greener town centre we installed resin bound tree pits; working around young trees, mature trees with protruding roots, bike racks, street lights and junction boxes. Vincent House, Notting Hill – as part of an eight month external refurbishment project we laid a permeable driveway in Barley Beach for this serviced, residential accommodation building. Ley Hall, Buckinghamshire – we installed our grid structure, sub-base SureCell®, a top layer of seamless SureSet permeable paving and created a fully SuDS compliant pathway; adding the perfect finishing touch to the refurbishment of this village hall. Bournville Gardens – a smooth, accessible footway was installed for a new The Extra Care Charitable Trust retirement village, Bournville Gardens, opening later this year. Anoopam Mission, Uxbridge – we created a beautiful 503m² resin bound pedestrian area outside the new temple with 3mm Tuscan Barley Beach and Almond. Kilburn Regeneration (phase 1 of 2) – as part of the south Kilburn regeneration project, we installed a 1044m² Barley Beach permeable footway to landscaped areas. Listers Land Rover, Droitwich – we installed a 61m² resin bound accessible pathway for this prestige car dealership in 6mm Norwegian Pearl. Rickyard Barn, Powys – we installed an accessible turning driveway in Norwegian Pearl for this customer whose friend recommended SureSet after seeing us at an exhibition. Spen Cottage – working with our customer’s builder Chris J Webb Ltd we installed a permeable residential driveway in Hughenden Valley Buckinghamshire. Richmond – another recommendation for SureSet where we installed 37m² of Sterling Silver for this external footway and steps project. Lakewood, Tunbridge – phase one included permeable pedestrian and vehicular access around and through the Neighbourhood Park and Jubilee Gardens. Phases two and three of this housing development are due for completion by September 2015. Winnington Road, Hampstead – as part of a refurbishment project, we installed a 345m² private access road in 6mm Norwegian Pearl. During July our nationwide network of Approved Installers laid 2780m² of permeable resin bound paving. If you would like any more information about any of our projects please contact us on the link below. If you are feeling social, why not share our Blog? SureSet Barley Beach created a fabulous new 24m² pathway that joins the outdoor pool surround we installed a couple of years ago. We’ve been busy installing 301m² of tree pits in Pearl in Salisbury town centre. We helped Esra Parr with this Show Garden using 6m² of our Norwegian Bronze. A 54m² residential straight driveway and pathway seamlessly installed in Barley Beach for these happy clients. Our talented Installation Team created a ‘wave’ for award winning, Elks-Smith Landscape and Garden Design from Hampshire. The wave was made using eight colours from our Spectrum® recycled glass range and can be seen at Tatton Park, July 22 – 26. We installed a 80m² pedestrian pathway using our sub-base SureCell and Natrural Aggregate in Bronze for this historic village hall. A 498m² Barley Beach pedestrian pathway was installed for this sensory garden. 45m² Barley Beach was used to create this smooth accessible residential pathway. An independent charitable hospice offering life changing adult palliative care, received a 78m² Chocolate pedestrian pathway.